The Rocs, Armina and the live blue team are going in mass for FISL. this is great news, showing that we have a great, growing, kde developers group here. confusing, and a required property name could be changed ( I know that I could modify the behavior, and I did, but I didn’t liked the outcome). 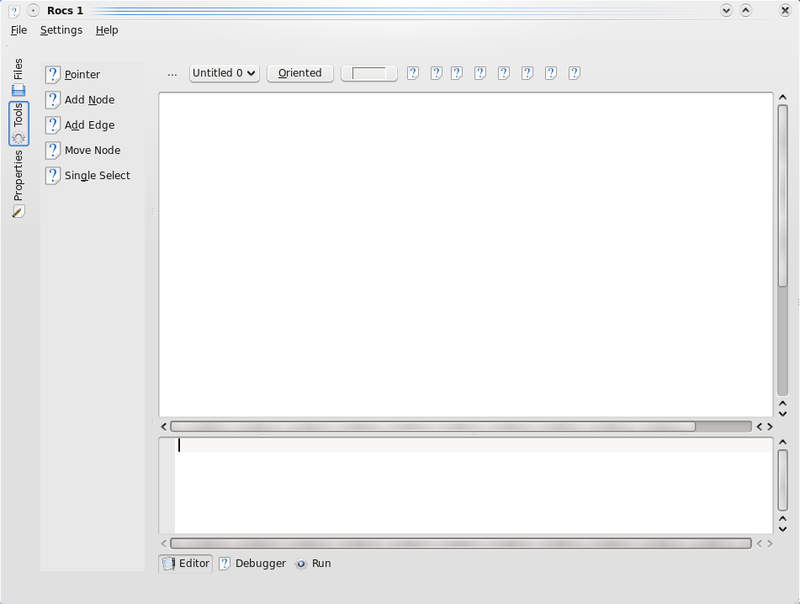 and created a better UI for accessing it’s contents. please, send me your thoughts. Automate support is getting quite well. 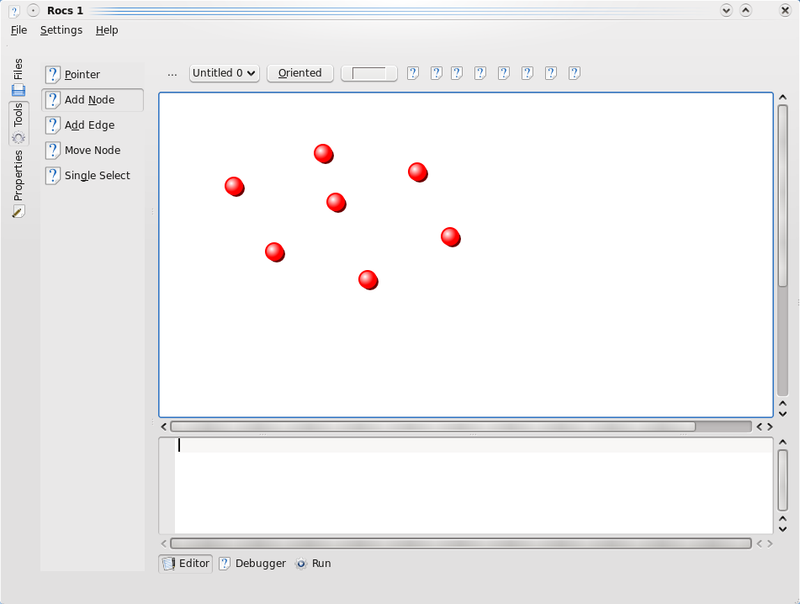 it’s now possible to define a start point and multiple end points ( only from script, I’m trying to make it work from the interface, but Qt model-view is giving me headaches, need to study it harder ). Posted by tumaix in gsoc2009, planetkde-tomazcanabrava. Since my studant is having some trouble with his uptime internet connection, I will repost here his post about GSoC, that was not sindicated at the time. Live Blue group is going to the 10th Brazilian International Free Software Forum (FISL 10), which will be held in Porto Alegre – Brazil from June 24th – June 27th. Yah, my dears, FISL will take place in the middle of the year, just when occurs in our state one of the biggest parties of the world: the festival of São João (Saint John – and that is bigger than Brazilian carnival in some states). But are we going to it ? Are we going to stay here, where it’s warm (even with the rain), eating our corn-based food, our peanut-candy (beloved, with the name of kid-foot), our bonfires and such ? And a bunch of others that I don’t have the picture to expose them: Adewale Andrade, Cibele Vasconcelos, Caio Tiago Oliveira, Nancí Bonfim, João Paulo Rabelo; and a few that didn’t confirmed yet, depending of “bigger forces” to confirm it or not. During the event, we will have a stand for the KDE/Live Blue team (apparently, we will be hosting a future KDE event). If you are Brazilian, baiano, nordestino, or just have the guts to be there, come with us. You will receive a warm welcome. de 2009, em Porto Alegre. Sim, meus caros, FISL em pleno São João. E muitos poderiam achar que isso seria um impedimento para a presença da maioria dos nordestinos, afinal temos até feriados regionais nessa época e festas nos interiores com direito a pipoca, amendoim, milho, fogueiras e fogos. Mas felizmente não foi dessa vez que nos arrancaram do friozinho de Porto Alegre, pois mesmo sendo a uma distância considerável da nossa terrinha, o evento vai contar com a presença de muitos baianos e até agora já temos, dentre esses, 10 membros do Live Blue confirmados. São eles: Sandro Andrade, Tomaz Canabrava, Vito Chiarella, Rodrigo Souto, Adewale Andrade, Cibele Vasconcelos, Luis Romário, Caio Tiago Oliveira, Nancí Bonfim e João Paulo Rabelo; fora os que ainda estão na dúvida, dependendo de “forças maiores” para confirmarem sua presença ou não. No âmbito do evento contaremos com um estande para o pessoal do Live Blue. Seja você baiano, nordestino, brasileiro, ou nenhum desses, basta que se interesse por software livre e tenha vontade de ir que você pode ter a certeza de que será muito bem vindo. Quem sabe tocamos até um forrozinho por lá?! It was about time I give you all an fresh view of the app that I’m writting. It’s development is slower than I wanted to, because of university, work and KDE-related-talks and groups (not that it makes an excuse, Chani also have those things, and she’s an amazing KDE developer. I’m just a bit lazy ;)). This is the default look, looks a bit like Kate, and actually Kate was an inspiration for me on the layout. This is the Pallete bar, like Step one (and yah, I need to remember to Hug Vladmir for the insight). Plotting some nodes on the canvas. The graphs are stored in memory, so there’s no need to save the file before trying to use them for scripting on. 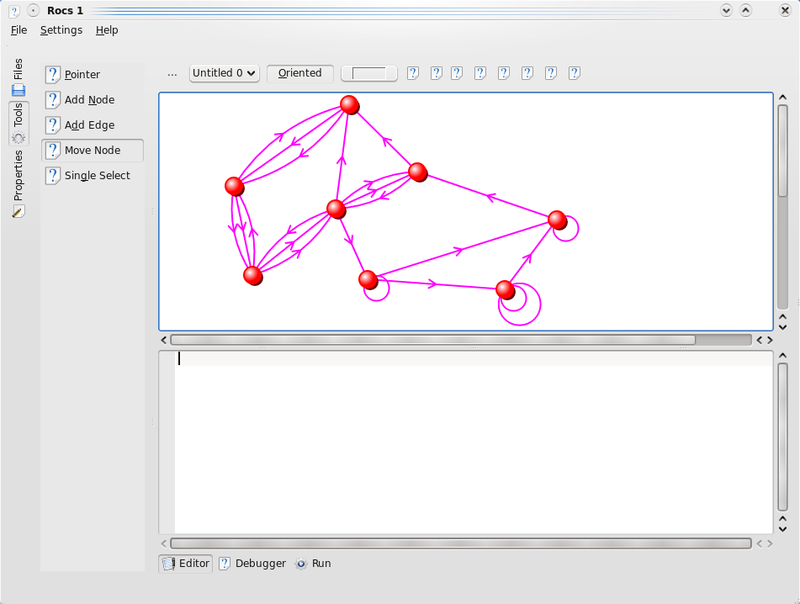 Simple graph with edges, this is an simple example on what kind of graph you could do with a few clicks. Nothing too fancy, I know. 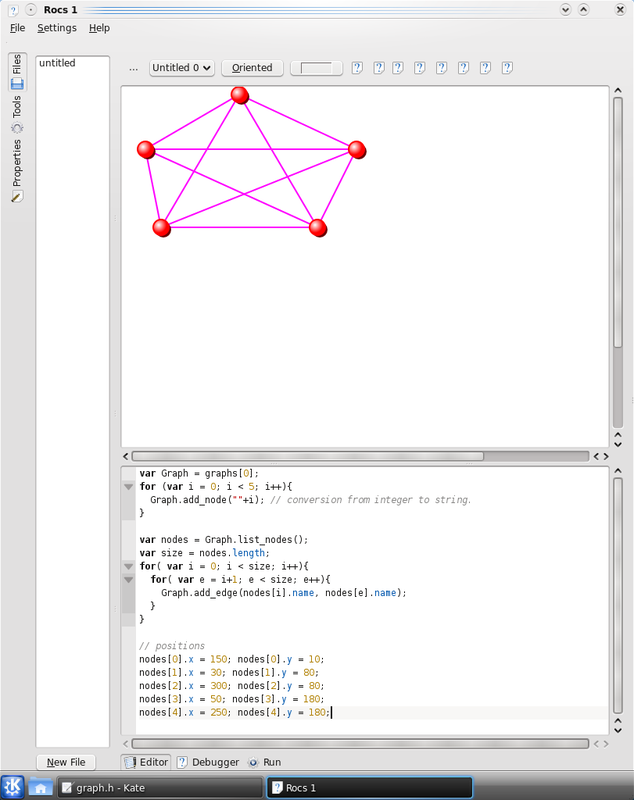 Transforming the graph in “Oriented”, you can use more advanced stuff, like multi-edging and loops. Pretty cute, actually. 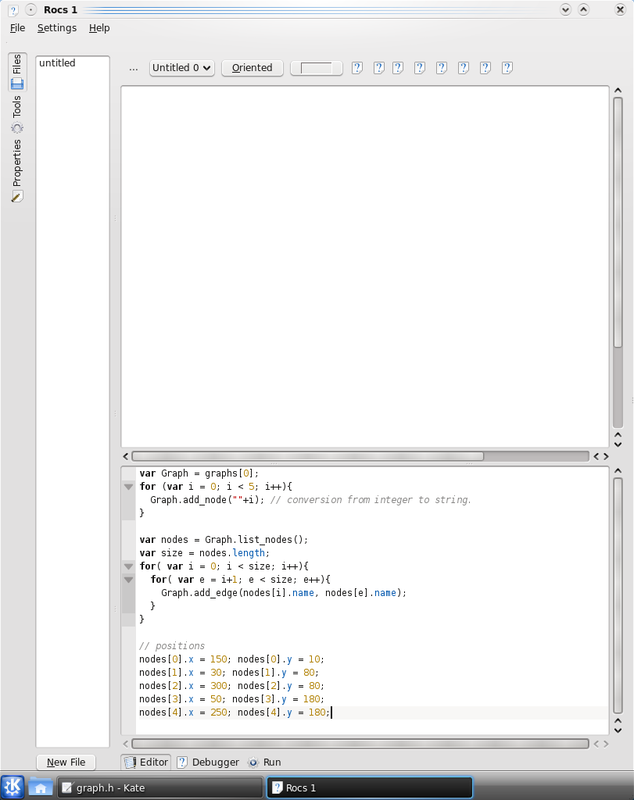 Properties pane, from here you can add new properties to the graph / node / edge in a way that they are easily acessible from the scripting area. 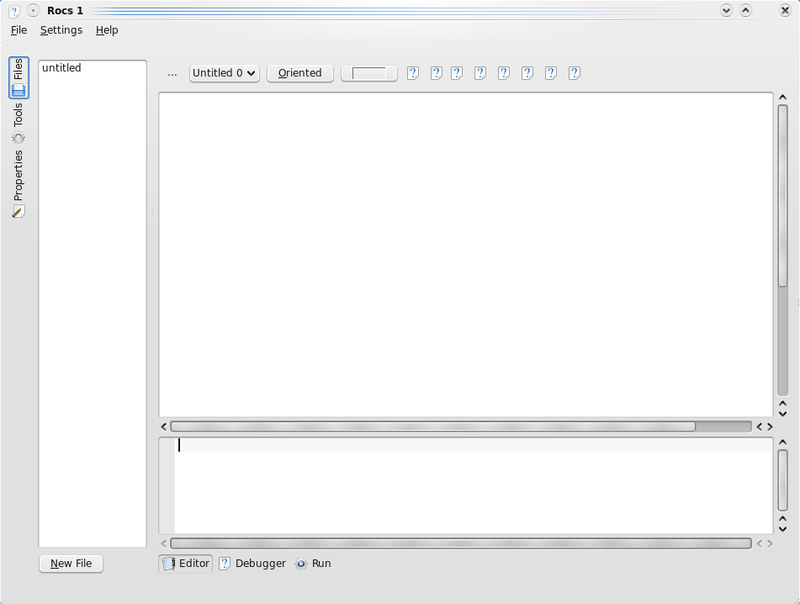 Pretty userful, but not working yet ;D (it lists everything, thougth, but I still didn’t code the ‘add’ button yet). 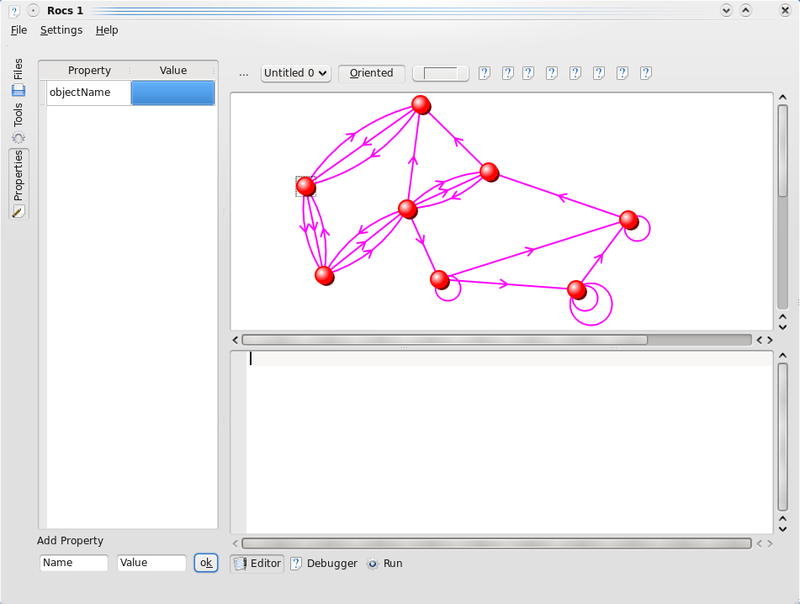 And here, just after I press the ‘run’ button, the graph is created and showed on the canvas.